The good news is, missing teeth can be easily replaced using state-of-the-art restorative dental solutions. The most common among all these would be Dentures. Commonly referred to as false teeth, dentures are prosthetic dental appliances composed of rows of artificial teeth. 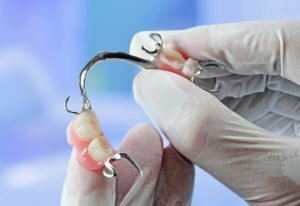 They are worn over your teeth and gums in order to replace the teeth that you have lost, giving you a complete smile and fully functional bite. The use of dentures is one of the oldest dental treatments; and with the help of modern dentistry, it has significantly improved. Yet, its function remains as it was – to restore your smile to perfection. See your dentist first for an initial consultation. Your dentist will make recommendations regarding your suitability and the type of denture needed for your case. Getting dentures commonly take 2 to 4 dental appointments. The first visit is dedicated to getting accurate impressions of your teeth, which are then sent to the dental lab. The dental laboratory will fabricate a custom tray, which will be used to set a more accurate mould of your teeth in wax. This will be used to create the final dentures. The dentures will be fitted and comfort and fit will be assessed. Your dentist will provide you with tips and instructions on caring for your new dentures.